The brand new Tatuaje K222 could make for an interesting test case for the reasonableness of the “substantially equivalent” pathway for approval under the new FDA rules regulating cigars. 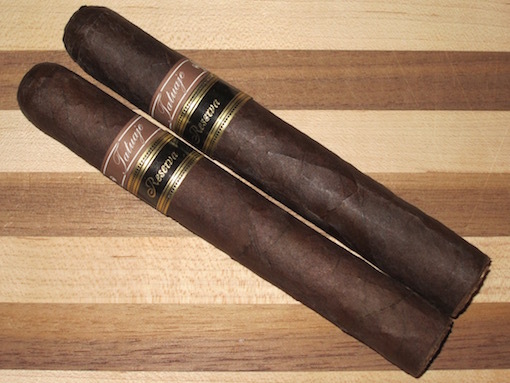 The blend is a combination of the Tatuaje Cojonu 2003 and the Reserva J21, both of which were sold prior to the February 2007 grandfather date. Under any normal interpretation of “substantially equivalent,” it should meet that test. Whether the FDA would be so reasonable is another matter. Plus, the small-scale production of the K222 (around 100 boxes a month made in Miami) means if the FDA process proves too costly, there might not be an application submitted to sell the cigar past 2018. Like many cigars produced in small numbers, if the cost of an approval runs into six figures, the math simply won’t work to keep a cigar on the market that only sells tens of thousands per year. The K222 was released two months ago as a tribute to Pete Johnson’s late dog, Kona, who passed away at 2:22 PM on April 26, 2015. Like the J21 and Cojonu 2003, it features a dark Ecuadorian Habano wrapper around Nicaraguan binder and filler tobaccos. The toro-esque size (5.9 x 52) comes in boxes of 25 with a retail price of $14. Before firing up the K222, there is little in the pre-light draw (slight grass and a little spice on the lips) that warns of the full-bodied experience to come. Once lit, you’ll find loads of powdery smoke with lots of oak, unsweetened chocolate, earth, and pepper spice. There is a slight bitterness that reminds me of banana peel. But just as it gets to the edge of the bitterness line, a slight sweetness reveals itself as it settles into a full-bodied cigar with sneaky strength. Given that Cojonu essentially means ballsy, it isn’t surprising that the K222 (based in part on the Cojonu 2003 cigar) is a full-bodied smoke. Perhaps if you were expecting a more refined smoke you would find the K222 trades balance for full flavors. But if complex, full flavors are what you seek, Kona’s cigar delivers in droves. With excellent construction, deep, enjoyable flavors, and a subtle yet sneaky punch, the K222 earns a rating of four and a half stogies out of five. I’m smoking one right now and I get that banana peel bitterness…not very off-putting but would be a 5/5 without that and the constant touch-ups from the very thick Habano wrapper.